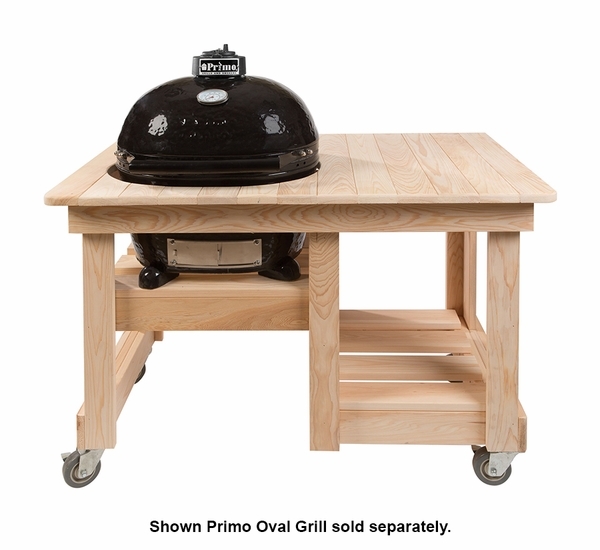 With over 700 square inches of preparation space, the Primo Counter Top Table, paired with the Primo Oval 300 Grill, gives you over 1000 square inches to grill up an amazing meal. It's made of unfinished cypress, too - so you can match it perfectly to your home deck! It's also got plenty of storage space underneath, so you can keep your cooking equipment on hand and ready to go at the drop of a hat. WARNING: Burning charcoal in this product can expose you to checmicals including carbon monoxide which is know by the State of California to cause birth defects or reproductive harm. For more information go to www.P65Warnings.ca.gov.